(I don't wish to give the impression that I only ever watch TV, but...)...I was watching TV last night and was entranced, enthralled and utterly gobsmacked by a series, currently showing on the UK terrestrial Channel 5, called 'Pub Dig' (well, OK, so it's full title is 'Rory McGrath's Pub Dig') for this is quite simply brilliant (and, dare I say it, one of the best archaeologically themed programmes that I've seen for a very long time). ....well, just digging if truth be told. They talk strategy (in the pub or, if the weather is good, in the garden of the pub), get in a big machine (and a dedicated, if largely silent, set of circuit digger types) and then proceed to cut a small-sized hole through various layers of human debris (which they analyse and discuss with obligatory pint of beer) find stuff (pottery, glass, clay pipe etc) and then assess what they think it is they've found and what it all means. There's no attempt to make the discovery the "most amazing thing ever found" or sound as if it "will revolutionise our understanding of..." etc. Just pub dig; a dig in a pub with some finds, none of which are particularly amazing, but all of which have a very human story to tell. There has been a very real problem with archaeological-related TV of late in that potentially interesting stories, sometimes of research ongoing or only part finished, are grossly oversold, so the unwitting public are asked things like: "could this be the most explosive discovery ever?" or "could this one site change our perception of the world?" to which the answers are inevitably 'no' and 'no'. In such circumstances, and in such over-hyped programmes, disappointment will usually have hit the viewer hard by the final reel, presuming, of course, that they've successfully managed to sit through the multiple ad breaks and endless repetition from the deep-voiced narrator (reiterating the 'main conclusions' so far for those who've only just tuned in). This short-lived series, first screened in the UK in 2004, was, in retrospect, quite brave attempt to introduce the concept of archaeology to a younger audience; one who might not normally watch such heritage-related staples as Time Team or Antiques Roadshow. The name reflected the (then) popular craze of adding the word 'extreme' to anything in order that it might appear more of an adrenalin-fuelled, white-knuckle thrill, such as the (short-lived) sports 'Extreme Ironing' (carefully removing the creases from a shirt on an large collapsible ironing board whilst suspended by a goat-nibbled rope from a mountain top above a vertigo inducing crevasse), 'Extreme Chess' (two people playing the popular board game whilst dangling from a high-wire set across a busy motorway) and 'Extreme Sudoko' (playing the frankly rather dull numbers game whilst suspended from an elastic band tied to a stick above a piranha-infested river - ok I made that one up, but you get the picture). Extreme Archaeology was all about the investigation of sites considered 'too dangerous' for mere mortals (with all their attendant Health and Safety legislation) to examine. 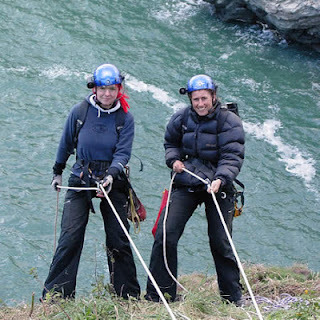 It was as much about the process of getting to the archaeology (caving, pot-holing, swimming, abseiling, sky-diving) as the investigation itself. Now I must admit that I quite liked Extreme Archaeology. As I've probably noted before, I'll consume any archaeo-related bit of TV programming - love it - can't get enough of it (I even obsessively watched every last bit of Bonekickers, the BBC drama from 2008, described by the Beeb’s publicity machine as “CSI meets Indiana Jones” and (perhaps less favourably) by Charlie Brooker as something which “combined the nerve-jangling thrill of archaeology with fatuous, made up bulls***”), but the general consensus amongst reviewers and the public (at least those who were asked) towards Extreme Archaeology was unfortunately hostile. One reviewer described it as “a pointlessly testosterone-fuelled attempt to grab ratings”, whilst another called it “Time Team on steroids”. It was not commissioned for a second series. This is, I think, why Pub Dig feels like a blast of extremely refreshing air. Yes, it is a wholly artificial construct (what TV programme isn’t? ), but it has no pretence about it; no pseudo-pompous tone; no over excited (and unnecessary hype). You get, quite emphatically, ‘what it says on the tin’. Pub dig. A dig in a pub. Watching it, I was taken back to the heady days of my youth, conducting urban watching briefs in densely built up areas staring forlornly at the unfolding excavation of small machine-dug trenches, cut through centuries of human detritus (concrete, bottle glass, tarmac, corroded iron, smashed china) in the hope of avoiding a direct hit onto a live electricity or gas main (or worse an active sewer). The series is a bit like Archaeological Watching Brief - the movie (except with more beer). I don't know who suggested this particular series or who successfully pitched it at a programme planning meeting, but they deserve a medal (or at the very least a big hug). My only (very minor) quibble (other than the worry that all archaeologists in this programme appear to be 1) Male 2) bearded 3) rotund 4) beer-swilling - all of which is sadly true in my case) is the much-repeated comment “now that’s archaeological gold”, which, on one memorable occasion, was made when it was revealed that the organic-rich layer freshly excavated was, in fact, human excrement, because archaeological gold is in fact....well gold actually. Poo, although undeniably of archaeological importance (if we want to understand the eating and digestive habits of past (or passed) societies), is clearly not a precious metal (unless I've missed the latest bit of Alchemy News - or 'Poo into Gold') - there won't, I suspect, ever be a report on the Ten O'clock News that "Poo has been found by metal detectorists working in Oxfordshire" (probably because I imagine that happens quite a lot) – but, hey, that's a minor quibble amidst a sea of archaeo-contentment. Viva ordinary archaeology ! Viva under-hyped archaeology ! Viva unexpectedly exciting archaeology ! 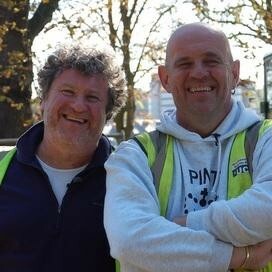 Viva Rory McGrath's pub dig ! Viva las Vegas ! (well ok, maybe not the last one). Having grown up in the south of England and having lived in New Zealand for the past 16 years I devour anything historical because I miss it so! Pub Dig is down to earth and easy to relate to and even managed to dig up the courtyard of a pub where I ate lunch a couple of years ago! Joy unbounded and I hope there will be more.